With the city eagerly braced to cheer on the world's most elite triathletes this weekend when the ITU World Triathlon Series Leeds makes its return, it's fair to say triathlon as a sport has well and truly broken out of the shadows. Returning to the city for a third consecutive year on June 9 and 10, the prestigious sporting event has proved to be a roaring success, with more than 70,000 spectators taking to the streets last year to get a glimpse of the action. While the huge crowds may have turned out in their droves to show their support to the local athletes taking part, including homegrown heroes Alistair and Jonny Brownlee, the growing interest in the sport as a whole can't be doubted - particularly here in Leeds. "We have seen first-hand the growth of the sport locally and nationally, but the success of Leeds-based athletes and the World Series race has had a major part to play for developing the sports interest," says Steven Sims, coach at Leeds Triathlon Centre. "Since the improved popularity of triathlon in the UK, and especially in Leeds, the number of athletes wanting to train with us has dramatically increased and it can be seen through all ability levels and surrounding local clubs." Run in partnership with the University of Leeds and Leeds Beckett University, the Leeds Triathlon Centre provides state-of-the-art training facilities to members of both institutions and currently boasts around 80 athletes. Budding youngsters can join the Yorkshire Talent Squad, which is affiliated with the centre, and follow the talent pathway, while Sims advises those who simply want to give triathlon a go to begin with shorter distances, such as the Go-Tri events, as a fun route into the sport. "There are a lot of local clubs and facilities in Leeds which have triathlon specific aims and are suitable for all ages and abilities," he says. "The barriers to entry are becoming less and less as the sport becomes more recognised and popular, and simple things such as attending park runs or local triathlons are key to building an individual's confidence." One such club which is inclusive to all levels of ability is the Leeds and Bradford Triathlon Club. At more than 600 members strong, it's one of the longest standing triathlon clubs in the country and has seen its numbers swell over the past few years thanks to events like ITU World Series being hosted in the city. "From our analysis of our membership, it's clear that several members have specifically signed up just to train for the big event in Leeds and our early season attendances at open water swimming this year have been at record levels," says Neil Holloway, communications officer at Leeds and Bradford Triathlon Club. While the Leeds and Bradford Triathlon Club boasts members who compete at the highest level around the world, Holloway explains that most newcomers are just eager to give the sport a go - and luckily Leeds offers the perfect training ground. "Most people new to triathlon find the swimming aspect the most challenging, as most of us have at least run for a bus or ridden a bike at some point, but few will have squeezed into a wetsuit and attempted to swim in fresh water," he says. "But not all of our members are swimmers and conversely not all ride bikes or run, so that's the beauty of being in a club that offers more than one discipline to train for. "Our training sessions take place using the same facilities used by the Great Britain elite squad and with the Yorkshire Dales providing world class cycling on our doorstep, it's easy to see why our location plays such a big part in our member's success." Events like the ITU World Series may have helped contribute to the growing interest in triathlon, but it's the world class training environment Leeds has to offer that is helping to develop some of the sport's top talent. 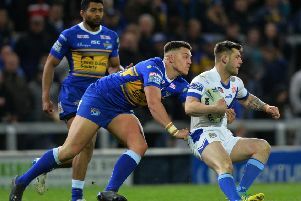 "Leeds has a great mix of training environments, including the tough and harsh nature of the Dales, but their is also great training group culture," adds Sims. "Leeds allows athtletes lots of variation in both their training and social lives, keeping them mentally engaged and their training consistent throughout the year. "We're fortunate enough to have state-of-the-art training facilities on our doorstep and as a result, we've become recognised as one of the leading triathlon centres both nationally and internationally. "It's this positive stature that's helping attract more elite and budding athletes to Leeds and what has helped the city gain high profile events like the World Triathlon Series."